The first records of plastic ingestion in fish date back to the 1970s, when fish were observed to consume opaque polystyrene plastic spherules present in the coastal waters of southern New England, US. Since then at least 92 fish species have been reported to ingest plastic. Plastic ingestion can happen both intentionally and accidentally depending on the foraging strategy of the animal: some predatory fish might mistake plastic for food and filter-feeders might ingest them unintentionally while feeding. However, sometimes the pathway of plastic ingestion remains unclear if the fish is able to use both filter-feeding and directional feeding. Ingestion is observed in both predatory fish, such as bigeye tuna (Thunnus obesus) in the central North Atlantic, and filter-feeders, such as herring (Clupea harengus) and horse mackerel (Trachurus trachurus) in the North Sea and English Channel. The percentage of fish that have ingested plastics in the nature varies between 2.6 and 36.5 % depending on the area and on the methods used for counting and extracting plastic from the gastrointestinal tract. Majority of studies have focused on counting microplastics, since they are numerically more abundant in the marine environment and due to their size easily ingested by various organisms. For example, in the fish caught from North Atlantic 94 % of the ingested plastic particles were described being microplastics. In the North Sea the percentage of microplastics was 74 %, but the macroplastics found inside a cod included for example a rubber strap of 50 cm length. Even though microplastic ingestion is observed more often, in some areas fish seem to be attracted to macroplastics as well: approximately 16 % of macro-sized plastic items examined in Hawaii show signs of attack from large predatory fish, which had bitten bottle-shaped items more frequently than any other shapes. However, the average number of plastic pieces per fish caught in the wild is observed to be relatively low: of the fish that have ingested plastic, the microplastic load is usually less than two particles on average. One of the highest recorded numbers of plastic particles inside a fish has been 83 pieces, and the amount of ingested plastic seems to be increasing with size. Clear differences between pelagic and benthic fishes have not yet been found. However, there are dissimilarities between methods, e.g. whether the fibers has been count, which make it difficult to compare results from different studies. Because in many studies a majority of fish that have ingested plastic contained only one particle, it is suggested that microplastics do not usually accumulate to the gastrointestinal tract of these animals for long periods. When classifying the plastic particles found from the fish, many studies have reported that the most abundant particles detected are fibers or fragments. However, the most abundant particle type has been observed to vary depending on the location: in one study, all of the plastic particles found from the fish collected from Indonesia were particulate, whereas fish collected from the United States contained primarily fibrous litter. The dominant material of plastic varies between study locations, but in the studies reporting different types indicate polyamide and polyethylene being the most common. Unintentional secondary ingestion of plastic happens, when an animal feeds on prey that has already eaten plastic. Secondary ingestion of small (< 20 µm) microplastics has been observed in a laboratory from Artemia nauplii to zebrafish (Danio rerio), and from Artemia to three-spined stickleback (Gasterosteus aculeatus), but information in the nature among fish is limited. There is, however, one known case of plastic transfer to fish: a ball of monofilament fishing line was found in the stomach of little auk (Alle alle), which had been ingested by a goose fish (Lophius americanus). 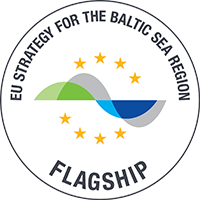 There is a lack of information of the plastic ingestion in the Baltic Sea area. Observations on fish containing plastics in their stomachs have been made occasionally in the studies examining fish diets. Plastic pieces have been found inside twaite shad (Alosa fallax) in the Gulf of Gdansk and Vistula River mouth. The relative numerical abundance of plastic in the diet of twaite shad in Vistula River mouth yielded 3.4 % on average. In the southern Baltic Sea 6.5 % of examined Atlantic cods (Gadus morhua), European flounders (Platichtys flesus) and Atlantic mackerels (Scomber scombrus) contained plastic particles. Most of the fish that had ingested plastics had only one plastic particle in their gut, and the amount of ingested microplastic particles per fish did not exceed three pieces in any of the fish. Additionally, in the same study no plastic was found inside the common dabs (Limanda limanda) or the Atlantic herrings (Clupea harangus). So far the effects of ingestion have been studied exclusively in the laboratory, and the studies examining fish caught from the nature have not reported any adverse effects of microplastic ingestion. The effects of ingestion cannot be fully understood before it is known in which extent and which rate fish are able to pass plastic particles through their gastrointestinal tract. Up to date there is a lack of studies of the microplastic accumulation, physical damage and excretion processes in the gastrointestinal tract of fish, but it has been suggested that plastics accumulating inside the fish might hamper the ability to buoyancy control, cause internal ulcerations, partial blockages of digestive tract and impair the satiation signal resulting in starvation. According to a study made with zebrafish (Danio rerio) majority of small (1-20 µm) microplastic spheres moved along the gastrointestinal tract and were excreted after 5-6 hours without any sign of accumulation or transfer to other organs. On rare occasions microplastic particles were taken up by epithelial cells, but it must be noted that the concentration of microplastics in the experiment exceeded environmentally relevant concentrations. In contrast, three-spined sticklebacks (Gasterosteus aculeatus) exposed to fragments originated from plastic bags as a part of their diet for 28 days showed prolonged gastric evacuation time compared to sticklebacks fed with only natural food. Accumulation of plastic may further lead to reduced food ingestion, lower energy accumulation and energy depletion. Physical damage may be more likely when ingesting secondary microplastics, which may contain sharp edges and are irregular in shape. Spherical polystyrene nanoparticles (24 nm) have been demonstrated to transfer from algae to cladoceran (Daphnia magna) and further to Crucian carp (Carassius carassius) in a study conducted in a laboratory. The ingestion of nanoparticles led to behavioral changes: fish moved and hunted slower than the control group and their feeding time was twice as long. In addition, nanoparticles caused disturbance in the lipid metabolism resulting in differences in the weight, triglycerides-cholesterol ratio in blood serum and the distribution of cholesterol between muscle and liver. The mechanism behind this is probably related to the fact that nanoparticles were observed to bind to apolipoprotein A-1, which is a fundamental component of the fat metabolism in many organisms. Polyethylene microplastics soaked in the San Diego Bay seawater has been shown to transfer persistent bioaccumulative toxic substances (PBTs) to fish (Oryzias latipes) in a laboratory setting. After two months of dietary exposure the PBDE content of fish was higher and the animals suffered from liver toxicity and pathology. However, the concentration of microplastic particles in this study contributed 10 % of the daily diet of the fish, and the effects in the nature are probably less distinct because of the lower concentration of microplastics in the environment. Exposure studies have also been made using bigger fish with high economic value. The European sea bass (Dicentrarchus labrax) was exposed to PVC particles for 90 days through their diet, which constituted 0.1 % (w/w) of microplastics less than 0.3 mm in size. Some of the PVC particles were incubated in a polluted Milazzo harbor, Italy, for three months to obtain a contamination level similar to the microplastics in the environment. After 60 days both polluted and native PCV particles had caused severe alterations in the epithelium structure of the distal part of the intestine and the severity of these alterations got worse with time. Even though there has been studies demonstrating the transfer of microplastics and associated chemicals to fish, there are limited amount of knowledge about their transfer in a food web. The transfer of BaP with microplastic spheres in a size range of 1-20 µm from Artemia nauplii to zebrafish (Danio rerio) is documented in a laboratory study. Desorption of BaP from the microplastics occurred in the intestines and some of the compound was detected also in the liver, but due to high individual variation clear physiological effects were not discovered.